An information security analyst is responsible for protecting the computer network of an organization or government agency from cyber threats. He or she creates, maintains, and controls security measures to make sure computer networks are regulated and monitored. As security threats to businesses and government agencies increase, the information security analyst role is becoming increasingly important. Generally, this is not an entry-level position. A bachelor’s degree in computer science, programming, or engineering is a minimal requirement, while many companies require a master's degree and many years' network experience. Information security analysts work with various members of an organization and must be able to communicate security measures and threats to people from a wide variety of technical and non-technical backgrounds. Below is a list of information security analyst skills for resumes, cover letters, job applications, and interviews. Included is a detailed list of the five most important information security analyst skills, as well as a longer list of even more related skills. According to the Bureau of Labor Statistics, 100,800 people were employed as information security analysts in 2016; their median annual wage in 2017 was $95,910. Career opportunities in this field are anticipated to grow by 28 percent by 2026 - much faster than in other fields. Secondly, you can use these skill words in your cover letter. In the body of your letter, you can mention one or two of these skills, and give a specific example of a time when you demonstrated those skills at work. Finally, you can use these skill words in an interview. Make sure you have at least one example of a time when you demonstrated each of the top five skills listed here. Information security analysts must have strong analytical skills. They have to be able to study computer systems, assess any potential risks, and consider possible solutions. Information security analysts must educate users, explaining to them the importance of cybersecurity, and how they should protect their data. They have to communicate this information in a clear and engaging way. Therefore, information security analysts need strong oral and written communication skills. Creativity is critical for information security analysts. They must be able to anticipate cyber attacks, always thinking one step ahead of a cyber threat. This kind of forward thinking requires a creative approach. Many threats to cybersecurity are hard to detect. Information security analysts have to be focused on the details of a security system, noting any minor changes, and foreseeing any potential problems, however small. Threats to cybersecurity are always changing, as are solutions. 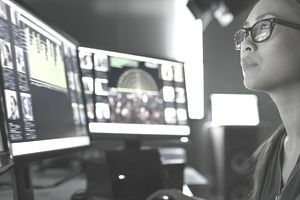 Information security analysts have to continually update their knowledge of the latest data-protection news, cybersecurity legislation, and practices and techniques. A good information security analyst seeks out this information and uses it to shape his or her problem-solving strategies.